We could come back in the New Year and wax poetic about the Dallas Cowboys, rip New England for puting Wes Welker on the field, or maybe even say "I Told You So" regarding what Indy did a week ago, but we won't. As a special treat to the others in the NFL, not in the postseason, we're giving out some honors. Jimmy Clausen or Ndamukong Suh? I've really got to tip my cap to the St. Louis Rams. While Eric Mangini and the Browns were busy closing the season out with four straight wins, the Rams put it in cruise control and locked up the #1 overall pick in this years NFL Draft. The leagues worst 1-15 record, St. Louis lost eight straight to finish the season and in the process were outscored 128-36 in the final four. The prize for St. Louis' bang up job in 2009, the number one selection in this years draft. This pick isn't the no brainer everyone is saying it is: (1) Yes, Nebraska's Ndamukong Suh is the consensus top eligible player available this year. However, the Rams need a franchise quarterback about as badly as Tiger Woods needed an alibi. (2) Notre Dame's Jimmy Clausen is good, his skills are better than that of one Mark Sanchez, the current Jet quarterback which both lead his team to the postseason this year and had major question marks around him last year at this time. (3) Either way, you won't be much better a year later. Neither Clausen or Suh makes the Rams viable in 2010, but one of them will certainly become the face of the franchise much like their last #1 pick overall in 1997, Ohio State offensive tackle Orlando Pace. And you thought the Colts were tanking a couple games to gain an advantage down the road. Finishing strong, saving jobs. Unlike in Seattle & Washington, the Carolina Panthers played the last month of the season to save head coach Jon Fox's job and in turn earned a ton of respect. The once 5-8 Panthers closed out the season with three straight victories against the Vikings, Giants, and Saints, now that is impressive. Their vaunted rushing attack suffered an important injury to 1,000 yard rusher DeAngelo Williams, but that wasn't enough to stop them. In the final two games with Williams on the mend, Panther running back Jonathan Stewart ripped off 331 yards rushing and hit the endzone twice. Despite their out of this world ground game, the Panthers should be pleasantly surprised with their replacement quarterback, Matt Moore. The 3rd-year quarterback out of Oregon State wasn't just their to manage the game after the season ending injury to Jake Delhomme. Moore came out and played well, the final five games of the season he turned the ball over just once and racked up eight touchdown passes. As a starter he finished the season 4-1 and completed 62.8% of his passes, not bad for a kid who could have been pumping your gas a month ago and we wouldn't have known the difference. Not many teams show up when they're are eliminated, the Panthers did just that and made some noise in the process. Newest 2,000 yard man, among other things. Chris Johnson is the best back in the NFL, I feel very comfortable saying that. 623 yards more than Vikings earth crushing running back Adrian Peterson. Nearly six yards per carry, 14 touchdowns, 12 100+ yard rushing games, and one 2,000 rushing yard season. Joining the company of O.J. Simpson, Barry Sanders, Jamal Lewis, Eric Dickerson, and Terrell Davis, Chris Johnson has made his impact on the game in just his second season in the NFL. When Johnson claimed he deserved the 2008 NFL Rookie of the Year over Falcons quarterback Matt Ryan, we thought he was crazy, whose crazy now? The best part of Johnson's breakout season isn't the 2,006 yards, it's the 8-2 finish he carried his Tennessee Titans to after they started out a very humbling 0-6. It's no secret that Chris Johnson can be directly linked the Titans late season run, 11-straight 100+ yard rushing games does that. Breakaway speed, bruising hits, Chris Johnson lays thunder & lighting to opposing defenses and cemented himself as the games elite running back heading into the offseason, it's only a shame we won't get to see him on center stage in the postseason. What's 44-seasons? Ryan, Smith, Blank celebrate! It has been a long season for the Atlanta Falcons. Returning from their 11-5 2008 season with the newly acquired future Hall Of Fame tight end Tony Gonzalez, the Falcons had big plans for 2009. Unfortunately, one of the toughest schedules in the NFL was too difficult for a young Falcons team which couldn't stay healthy. After a slow start, pro bowl running back Michael Turner suffered late season injuries which kept him out of five games. After an interception riddled start, 2nd year quarterback Matt Ryan was injured early in week twelve and sat the remainder of that game and the next two weeks, which the Falcons would drop both games. At 6-7 heading into the final three weeks of the season, watching their final goal of finishing with a winning record for the second consecutive year, the first time that would happen in the 44 year history of the Falcons, Atlanta needed wins. 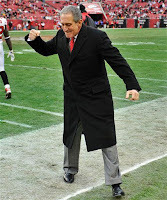 Well yesterday, they completed a three game stretch where they won all three and delivered owner Arthur Blank his consecutive winning seasons he so desperately wanted. Our hats at LynchyRightNow come off for Blank. A guy who was let down in the worst way by one Michael Vick, finally has redemption. The Colts and Saints may rest starters once their in the postseason, but Atlanta still had something to work for and delivered to their fans and their owner. Congrats! Follow us on Twitter . . . RightNowPodcast . . .and look out for the LRN Power Rankings: Wild Card Weekend, thanks for reading!